The Cuban red macaw (Ara tricolor) is one of the several extinct macaw species that once used to live in the Caribbean area. As all these species were driven to extinction by humans before they could have been properly described, identified and classified by modern science, there’s an ongoing debate among ornithologists about the exact number of species, their origin, range and taxonomic relations. Based on the various theories of the experts there could have been as many as 13 different macaw species endemic to the Caribbean islands. Many of the suggested 13 species are only hypothetical species, mainly based on old descriptions and illustrations – hopefully DNA analysis of fossil finds and further examination of contemporary sources can resolve the identity of these birds one day. There are only three Caribbean macaws known from actual modern physical remains: the Cuban red macaw is one of them. Date of extinction: As between 1844-56 several subsequent hurricanes destroyed their habitat and scattered the remaining population, by the mid-19th century the species was becoming rare on the main island of Cuba. 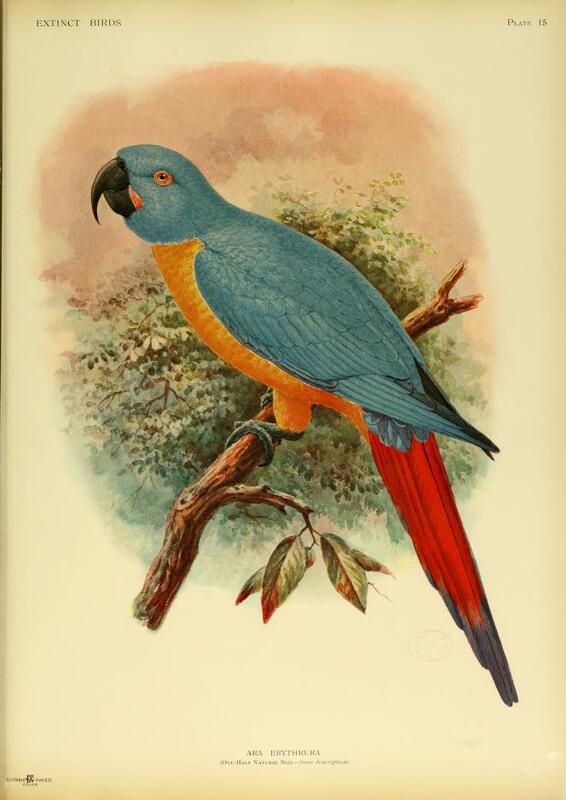 The exact date of the extinction of the Cuban macaw is unknown: based on the accounts of Cuban naturalist Juan Gundlach the last specimens could have survived until about 1885. 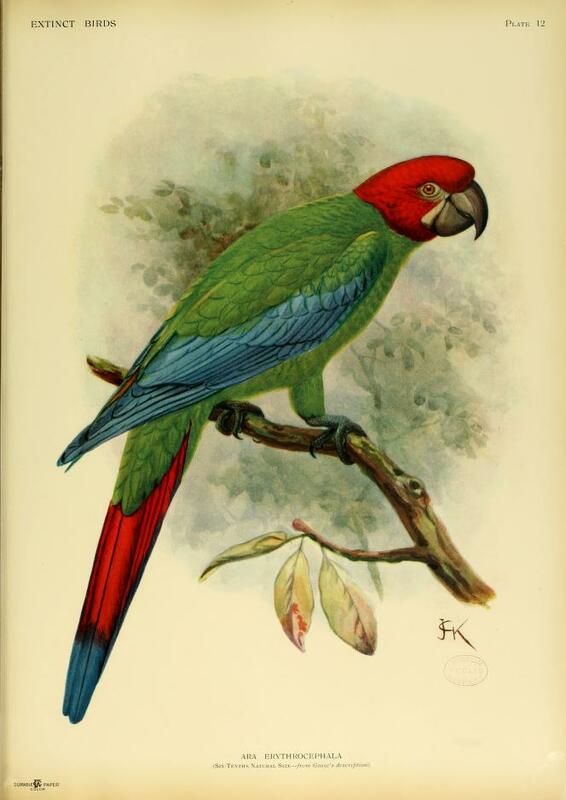 Range: Historical records and contemporary accounts show that macaws had been transported and traded regularly between the Caribbean islands and the mainland (South America) both in prehistoric and modern times by Native Americans, and by European sailors and settlers after their arrival in the 15th century; therefore, verification of the original range of macaw species can be rather uncertain. The Cuban red macaw was endemic to the main island of Cuba and probably the nearby Isla de la Juventud. Habitat: The Cuban red macaw used to inhabit the mixed woodland-grassland ecosystem with scattered trees (open savanna) of the central and western part of the island and the gallery forests of these areas. Many reports in the 18-19th century came from the huge Zapata Swamp located southeast of Havana – today, this area is the best preserved wetland in the Antilles and part of the Ciénaga de Zapata Biosphere Reserve and wildlife sanctuary. 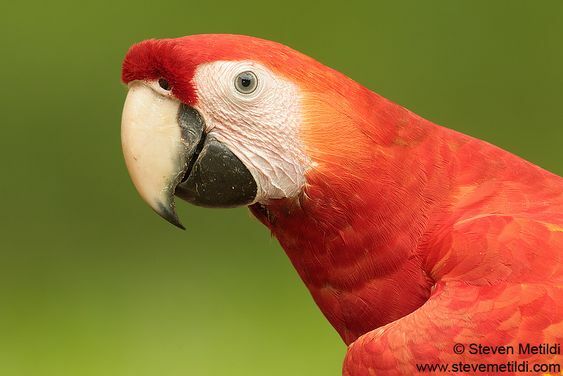 Description: With about 50 cm length, the Cuban red macaw was one of the smallest Ara species. Coloration of its plumage ranged from the red on the forehead through orange and yellow on the neck to brownish-red and purplish blue to the back, the wings and the tail. They had a distinct, white, unfeathered patch around the eyes. Male and female looked similar, as with other macaw species. Based on the similar distribution of red and blue in their plumage, the white patch around the eyes, their adjoining ranges, and a shared feather mite, one of the closest extant relatives of the Cuban red macaw is probably the scarlet macaw (Ara macaw). There’s little known about the behavior and breeding habits of the Cuban macaw. Their main food sources were probably fruits, seeds and shoots of palms and the chinaberry tree. Cause of extinction: Several factors have contributed to the extinction of the Cuban red macaw. 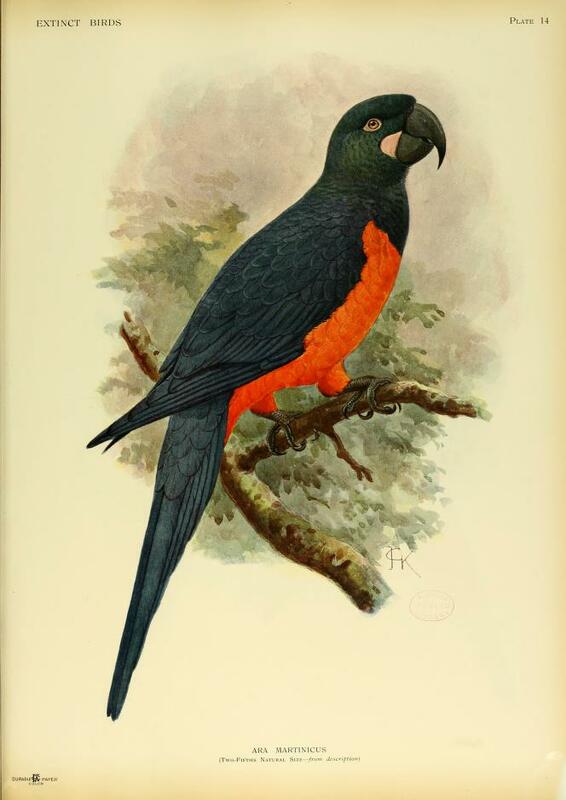 In fact, the main threats for all parrot species were and are very similar; they are often among the first species to be exterminated from a given locality, especially islands. The great green macaw (Ara ambiguus), a close relative of the Cuban macaw is listed as endangered on the IUCN Red List due to habitat loss, hunting and trade. 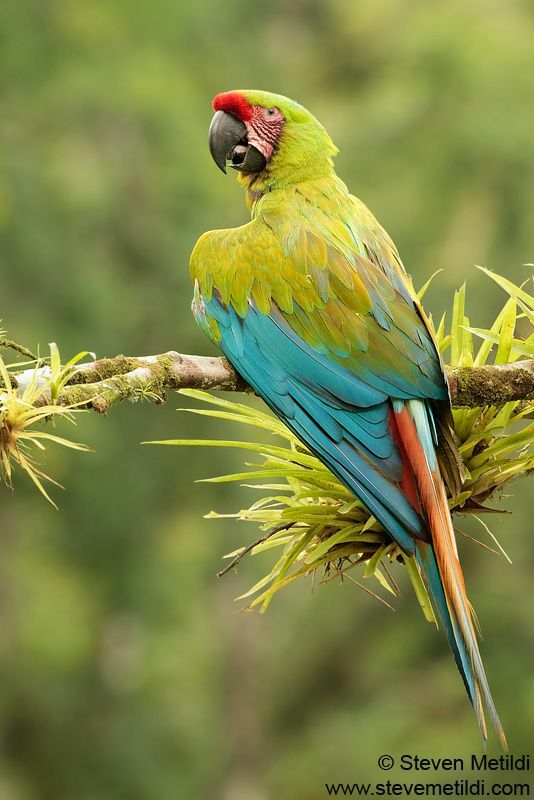 Parrots were frequently hunted and killed for food by Amerindians in the West Indies – there are even reports about macaws and parrots being held captive to fatten them. Cuban macaws had a reputation of being especially easy to hunt because of their ‘boldness’ (or stupidity) – the arrival of the European sailors and the introduction of firearms to the islands accelerated the dwindling of the population. 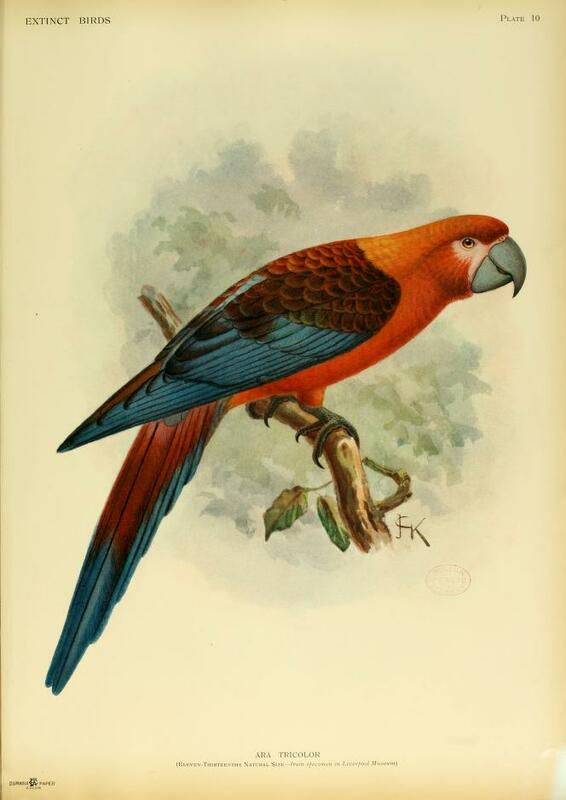 Another main threat was trade: besides being kept as pets locally by Native Americans and colonists, macaws were captured and sent to Europe as popular, valued cagebirds for zoos and private collectors – several of the preserved 19 skins of the Cuban red macaw originate from captive specimens. Collectors usually obtained young chicks by felling the trees with their nest, thereby also destructing the species’ breeding habitat. This practice is still common in Cuba and greatly affects the populations of the surviving parrot species. As more and more natural lands were cultivated in association with human population growth, habitat destruction also contributed to the Cuban red macaw’s extinction. They were also persecuted as crop pests because they fed on fruit trees. Once macaw populations were restricted to a few relatively small areas of fragmented habitat, direct hits by storms that would have had no effect on a healthy population proved to be detrimental. In addition, exotic diseases of imported pets and domestic fowls were also very dangerous to the indigenous parrot species that had little or no resistance against them. 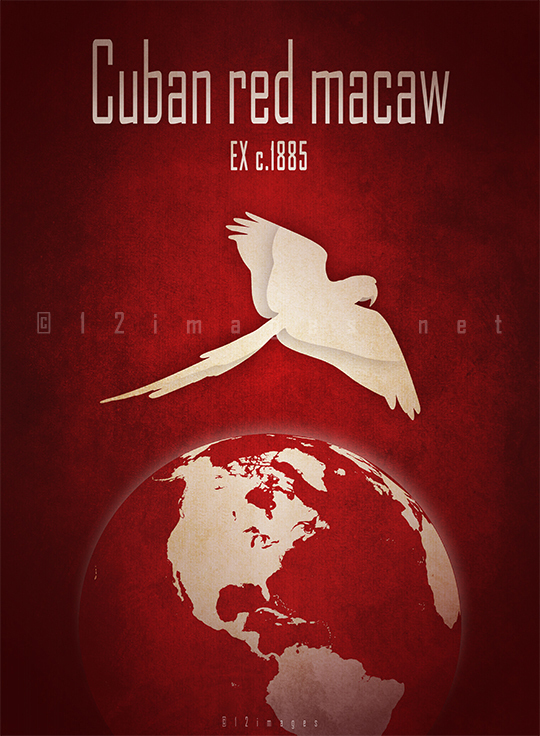 The Cuban red macaw poster at the top of this post is available in my store on Redbubble, with design variations more suitable for apparel and other products. My whole profit goes to the Sea Shepherd to support their fight to protect our oceans and marine wildlife.